The following is our response to the Welsh Government consultation on plans to develop a third crossing over the Menai Strait, to carry traffic on the A55. 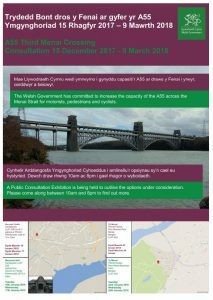 The consultation documents can be seen at https://consultations.gov.wales/consultations/a55-3rd-menai-crossing. Menai Bridge Community Heritage Trust was formed in 1997 to increase awareness and understanding of the history of the Menai Strait and its iconic bridges and their international significance. In 2007 the Trust purchased the building now known as Canolfan Thomas Telford and established the Bridges Exhibition, which achieved Accredited Museum status in 2013. The exhibition covers the history of both bridges. The Trust is concerned that any development on or near the Strait should have minimum effect on the environmental and construction heritage of the area. After consultation with the Trust’s volunteers, the Board of Trustees submits the following points in response to the current consultation exercise. The Trust welcomes the intention to make adequate provision for pedestrian and cycle usage of the crossing. This should improve the modal mix of travel over the Strait and encourage more leisure enjoyment of the two coastal paths between the bridges. The Trust wishes to point out that such provision could be achieved using the existing service deck of Britannia Bridge, with suitably increased railway protection and modest groundwork on the east side of both abutments, to link with existing rights of way. The Trust is aware of widely held views that the current traffic congestion at certain times does not warrant the construction of a costly and intrusive new bridge, but notes that the consultation document appears to state that the Welsh Government has decided already that “Do Nothing” is not an option. The Trust would welcome information on the work, done to date to investigate alternatives to a bridge, as well as the cost-benefit ratios for the different options, including the ‘Do Nothing’ scenario – options such as park and ride schemes, increased use of the railway (local services, long distance and freight). The Trust is concerned about the possible impact of both the likely provision of new high voltage electricity cables over or under the Strait and the construction of a new road crossing. The Strait and its shores carry designations recognising them as sites of nature conservation importance both nationally and internationally. The wider environment has landscape designations and the bridges are grade I and II listed structures. The Trust therefore firmly believes that any additional structure resulting from this consultation process must also make adequate provision for new or enhanced power transmission apparatus, which may eventually be determined necessary. We advocate that the Welsh Government and National Grid should work together, to ensure the most economic and environmentally acceptable joint solution, to both problems, being adopted and implemented. The Trust considers that the part of the Strait between the two bridges and the views of one bridge from the other are of paramount importance to appreciation of the heritage of the area and to tourism in North West Wales. Any interference with these key assets should be avoided. The only route option offered in the consultation, which avoids these assets is the Red Route. The other routes are all on the eastern side of the existing Britannia Bridge. It is understood that this requires some additional expenditure, due to the proximity of the existing overhead high voltage transmission line. The Trust also considers that any new structure should not dominate the skyline over the existing Britannia Bridge. The Trust does not accept the view implied at one of the public events that as parts of the present Britannia Bridge only date from 1980, it is not a heritage asset. Significant parts date from 1850 and it is a listed structure. The Trust therefore considers that neither the cable-stayed nor “extrados” design options are acceptable. The balanced cantilever design would meet with the Trust’s criteria, but we are of the opinion that insufficient investigation of single span, low profile designs, has been carried out prior to the public consultation exercise. The Trust therefore recommends undertaking further feasibility studies, of other single span designs, which might better match the existing structure. Such a solution would not only improve the aesthetics but also avoid major construction activity on Britannia Rock or in the Strait itself. Both Telford’s Suspension Bridge and Stephenson’s Britannia Bridge were pioneering engineering achievements. The Trust suggests inviting designs for any new structure, to provide an example of innovative British 21st century engineering and to complement the two pioneering structures of historic importance. For example, steel box girder bridges, of much greater span than that required for the Red Route at Britannia, have been successfully constructed over recent decades. A possible method of construction for such a structure would be to fabricate the box girder on the shore, float it into location and raise it into position. This approach would reduce the impact of work carried out in proximity to the existing overhead transmission cables and eliminate the need for engineering work in the Strait itself. It would also demonstrate development of the methods used to construct the original 1850 tubular bridge and the 1970s arch reconstruction. To conclude, the Trust holds the view that if it is decided to increase carriageway capacity on the existing Britannia Bridge, the Red Route with a low profile, single span structure is preferable to the balanced cantilever design offered in the consultation document. Trustees would be delighted to welcome members of the project team to the Menai Heritage exhibition and collection and to discuss the project in more detail. As an accredited museum, may we request a complete set of documentation, relating to this latest project spanning the Menai. Bob Daimond B.Sc., C.Eng., C.Env., FICE, FCIHT. ← Previous Previous post: Prince’s Pier – The Next Chapter?